I am bad at sleep. Where others soar through the hours of slumber with snoozy assurance, I stumble. I'm inconsistent. I eat late. I look at my phone in bed. I'm definitely better since embarking on my sleep diary last year, but I could be a lot better too. Which is why I was thrilled when Fitbit announced it was launching some new sleep features that would not only track my sleep more accurately, but start telling me what I can do to improve it. Fitbit is looking more closely into how we sleep using a combination of the accelerometer and heart rate tracking. It's also looking to user sleep trends over time to offer tips on how to build better habits. I've been wearing the Alta HR for a few weeks now, but has it helped me do any of this? Generally speaking, I find the Alta HR itself to be good at working out when I've drifted off and when I've woken up. There has been the odd night where it got my numbers way off, and sometimes I can see that it didn't notice I was awake until 10 minutes or so after my alarm went off, but it's had a better success rate than most wrist-worn sleep trackers I've tried. I can't, however, speak for how much time I spend in each stage nor all the times I allegedly woke up for a few seconds in the middle of the night. That would require some time in a sleep lab. But no matter how accurate it is, this information isn't much use in isolation. Fitbit's new app also offers benchmarking so you can see how you compare to others in a similar age bracket, and that's a good way to calm anyone panicking themselves that 18% of deep sleep is terminally low (it's not, you're fine). Again though, that's all well and good, but what can I do with this information if I actually want to improve my sleep? That's where Fitbit's Insights step in, bite-sized tips that pop up in the app on some (but not all) days. I've found these to be varying in usefulness, but consistency is certainly key. That's because, while some of the tips are generic, others are tailored to you by analyzing your sleep habits over time. Even within these however, there's a varying amount of utility. For example, my latest "insight" tells me that I slept an average of 8 hours and 47 minutes over the weekend, which was a bit more than my weekly average. "That swing may be a sign that you're not getting enough sleep during the week," it said. Yes, well spotted, but I could have told you that. "Night owls go to bed late and wake up late, while larks do both earlier," read another. "Based on your trends, you're more of a night owl." Again, not a revelation. My bed time isn't stupidly late, but it could be earlier. On another occasion when I was getting more consistent bedtimes, Fitbit congratulated me and explained why this is important for circadian rhythm. Now that was more helpful to know, and good encouragement for sticking to a routine. Sometimes, the insights aren't about me, but just offer a bit of science. One explained the function of light sleep for the body. Another told me: "If you wake up frequently, your sleep environment might be part of the problem. A better mattress or pillow could help you stay in deep sleep longer". I'm not sure if this one was based on my patterns or not, but it was still helpful. Where Fitbit's insights have shown signs of more useful ideas is in picking out these longer, personal trends. A couple of friends have shown me insights they got telling them how much more sleep they got on nights they went for a run. Oddly I haven't seen this on mine yet (which is curious because I have been running a lot recently) but that type of information is definitely more handy. Really handy, in fact. My hope is that over time the insights start bringing in more factors. How does my VO2 Max score affect my sleep behavior? Did I sleep better on days I did more guided breathing exercises? Right now Fitbit doesn't measure stress levels like the Garmin Vivosmart 3, but when it does, this could be another metric to put in the equation. The more things Fitbit can track in future devices and updates, surely the deeper the insights can become. Activity is one element, but sleep is affected by so much more. Fitbit's food logging didn't win over editor Mike Sawh, but it's in there, and if Fitbit can make this part of the ecosystem more appealing then it could also help us understand how our diet affects those graphs of precious sleep. Water intake too; hydration is important for sleep. The better Fitbit's platform can get at integrating with third-party apps, the more information it could bring in too and the richer its insights can become. Also, how does it move the other way? How is my sleep affecting my activity? Is there a noticeable decline in the quality of my workouts because of my lack of Zzs? There are obvious limitations to what Fitbit can do on a tracker on your wrist. While it can give you broad tips about sleep hygiene, it can't, for example, tell you that your room is too noisy at night. Or too light. Or too dusty. But these are all essential things that some of the dedicated sleep trackers are starting to look at. The ResMed S+, which I tried for a few weeks, wasn't so great in the accuracy department, but what it could tell me about my sleep environment was more useful. 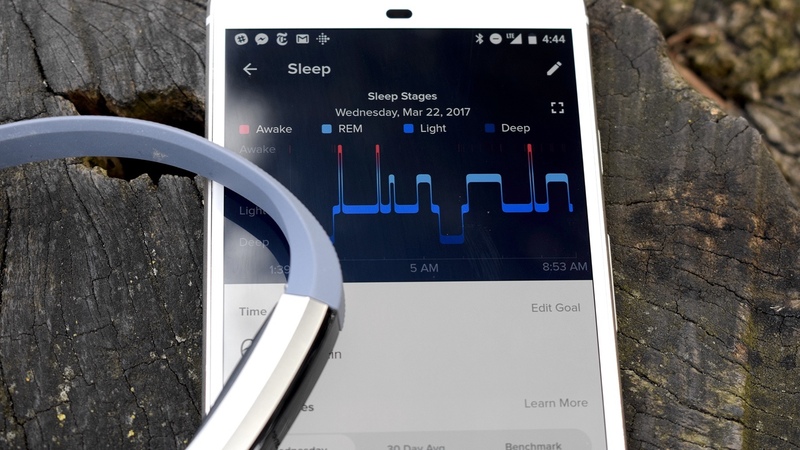 It feels like Fitbit's sleep insights are a solid foundation, and easily the best of the two new sleep features, but I'm more interested in where it can go from here, and how, over time, Fitbit can start understanding the bigger picture when it comes to sleep.